Walmart has a professional hardware section, car care products, and rollback savings on these items. 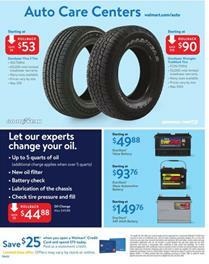 New tire deals might be useful for car owners. Seasonal changes may require maintenance and tire replacement. Auto section of Walmart offers Goodyear Viva 3 tire for only $53! You have a $6 saving on that tire. Another deal is Goodyear Wrangler trailmark tire which will cost $90 that is $10 saving. That tire comes with a 55000 mile warranty. Save $25 when you open a Walmart credit card. You can also find deals on car batteries. EverStart value battery is $49.88 this week. This is a starting price and all three deals show the starting prices of the batteries. Oil change will cost only $44.88 at Walmart. It's $5 cheaper now. If you like to solve problems of your house or work on a DIY project, there are deals just for you at Walmart stores this week. Find Hyper Tough drills, impact drivers, circular saw, tool boxes, and more products. Get your quick charger and batteries for these products. A new Hyper Tough 20V 2.5 amp batter quick charger will cost only $34.74 at Walmart. Tool boxes, gloves and more hand tools are also on sale in this range. 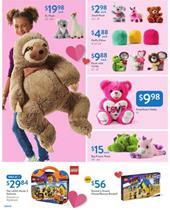 Walmart Weekly Ad also has a great range of video games, LED Smart TVs, iPhones, and home products. Subscribe to this page to see all the deals on your email address. A new Walmart Ad is available now. Find breakfast foods, snacks, packaged meals, Great Value products and much more are available in the first part of the ad where you can find grocery items. Buy Frigo cheese heads string cheese for $7.96. Those are some delicious cheese strings. 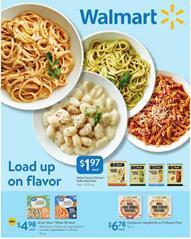 Walmart's simple meal solutions are sufficiently doing a great job. Many people love them for their low prices of high quality. Most Walmart Ads advertise such products at new lower prices. On the other hand, you see alternatives for cooking, too. In this sense, Walmart Ads are wise sources for seeking a good deal on food. One of these practical solutions for those who lack time for cooking is Sam's Choice Italian meals. They have these priced at only $1.97! Great Value whole 30 meal is only $4.98 and that's a new item. In this ad, you can also find household supplies, VisionCenter deals, kids safety products, Auto Care center deals, tires, power tools. Moreover, entertainment deals like video games for console are also viewable. These deals are only valid until February 14. You have a good range of products including plush animals, exclusive toys, sleepwear, gifts of jewelry, accessories, fashion and decoration products for your home. If you like to celebrate this day with your lover or spouse, I recommend you to prepare with some of these products. Also, sweets are like an essential to this day. Most people go with some wine or a classy drink but sweet treats will also handle a great part of the romanticism. Candies, treats, bakery products and more are featured products on pg 23-24. Don't forget to see this part of the latest Walmart Ad. Buy some gifts for yourself and for people you plan to spend this special day. You can order and pick up in-store for free on the same day. 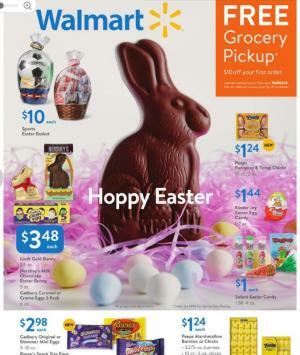 Walmart offers 100% money back guarantee and $10 off your first order. That's a very clever idea considering the time you spend during visiting each shelf. A huge time is saved if you prefer online orders and picking up your products in stores of Walmart. 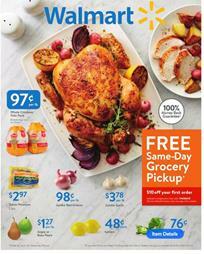 Again Walmart Ad has a very good food range in on first 9 pages. 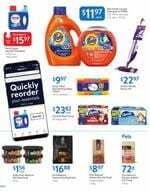 Full of rollback savings and price drops, it offers a wide range of products with a variety that I think you regularly love. Angus meat, frozen tilapia fillets, and Valentine's Day treats are a few examples from this category. Check out pg 3 for Whole cooked lobster, baby peeled carrots, broccoli florets, and more Valentine's Day specials. Eat, drink, spend quality time with your beloved. Check out snack foods, too. For those who don't like romantic nights, these are perfect foods. Hormel gathering party tray might help you for quick preparation. Buffalo wings, vegetable tray with ranch dip and more products are available at Walmart stores this week.